YeeHaw! I was able to finish the two blocks I had planned for the OMG. And, surprisingly, I finished them really early -- maybe in the first week. I don't remember. I actually looked at doing more blocks but as usual I was overcome with indecisiveness. It takes me longer to pick the fabric for each block then to make the blocks. Sigh. Much of this block was already done -- letters were cut out and some of the backgrounds were already chosen. The majority of the time was spent stitching down the letters and making the tree. Excellent. Now if I could just get going on some more blocks. Which comes to my September goal: I'm going to get two more blocks done from the Christmas Favorites book. Yes, really. I'll pick the colors and get two more done. I may work on pieced blocks instead of appliqué but it's picking the fabrics that always gets to me. I was thinking of using a block kit I bought in Alaska in the mid '90s but I'm not that in love with it and its mate. (What was I thinking when I bought an Alaskan version of Sun Bonnet Sue?) I have it on the goals for this week so maybe I will spend time sewing it down but we'll see. I'm linking up with Red Letter Quilts and Let's Be Social. Take some time to see what others are up to in their studios. Love the blocks you have nearly finished. Love those ornaments! This is really going to be charming & I look forward to the next two too! Good Luck selecting fabrics with time left for stitching, hehe! Cute ornament blocks. 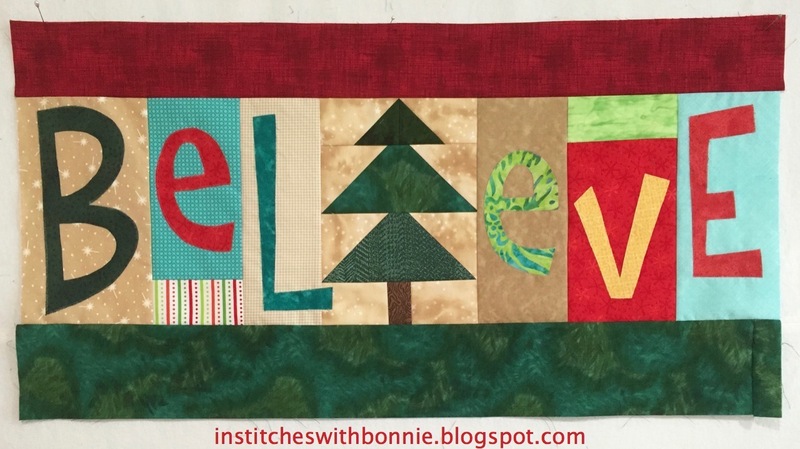 Someday you'll have an awesome Christmas quilt! Love both these blocks Bonnie. This is going to be a wonderful quilt when finished. Oh Bonnie, these are beautiful blocks! I love your fabric choices! Congrats on meeting your goal! I see it is time for Christmas sewing =) Nicely done! I really like that Christmas ornament block, very pretty. Congrats on making your August goal and good luck with Septembers.